Retail $19.00 SAVE 20% ! Normally I am not one to be surprised, however I am with this product. Tamiya delivers in spades, very little discoloration of sprue&apos;s on my predominantly ship/submarine scale model efforts. Precise enough I usually sand with a fine/ultra fine over another cutting tool rarely need a 2nd leveling cut. Ideal for trimming parts from plastic trees. It may be the best tool for any modeler. It is safe and convenient to use. You don&apos;t need to pull much strength to use it. And the cut is smooth and flat. So this product is really great. I would recommend it to everyone who needs it. 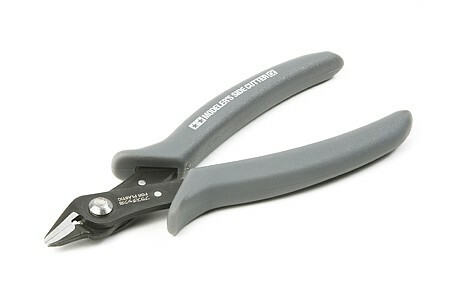 I like these sprue cutters. I also like the gray color. I think they are of good quality and design. "one of the best cuttrs for the price"